“This kind of blog just writes itself, doesn’t it?” smirked Jon as he was sent back to the store for last minute sherbet. The muppets are in bed. Last night, they slept for nine hours. I suppose I shouldn’t be that surprised – they’ve had a busy week. Yesterday, they came to visit me at work – in costume. With so many colors, lights and new people moving all around them, it was quite a bit to take in. Tomorrow we celebrate – in costume again – at a Halloween brunch, followed by candy and trick-or-treaters on Sunday. Before bed tonight, we watched “It’s the Great Pumpkin Charlie Brown.” That cartoon, along with picking out a pumpkin from the pumpkin patch, are some of my favorite spooktacular memories of childhood. As G.G. mentioned in the Tiny Disguises post, Halloween has become quite an important holiday – at least in terms of childhood memories. So, in anticipation of the muppets future memories, we decided to tell scary stories reminiscing about the past. Much like me, a pumpkin from the patch was a traditional part of the haunted holiday for Aunt J. One year, Joanne became determined to procure a “real” carved pumpkin. Back in the days before open land was parceled into suburban track homes, there was a 40-acre field across from the house she lived in – where a farmer happened to have a bumper crop of autumn fruit. Her best friend (and trouble-courting sisters) had already successfully managed pluck their own from the farmer’s field. They said it was easy. All she had to do was walk onto the field and chose her favorite. Joanne was young, daring, adventurous and innocent. She decided she was brave enough to attempt the perfect great pumpkin heist. She had the courage, naiveté and peer encouragement. What she did not have, however, was timing. The caper commenced right after school, at the mysterious witching hour of mid-afternoon. 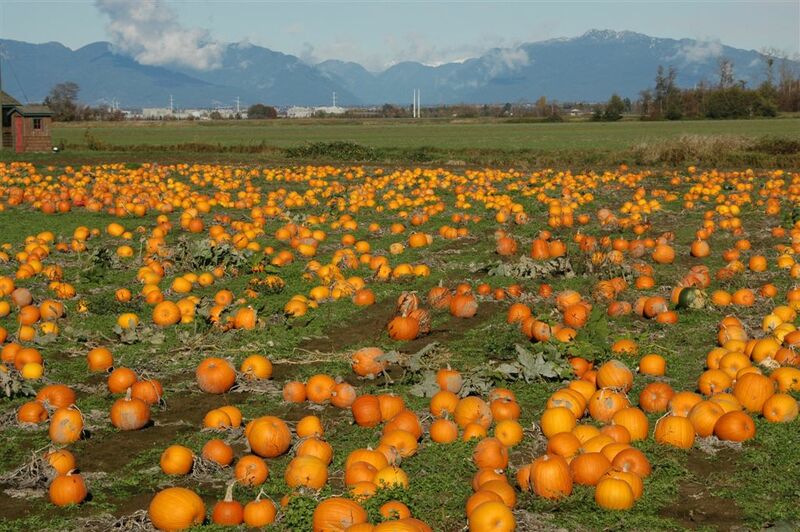 She approached the field with caution and selected the prime, perfect, plump pumpkin. Then she started making her way home. G.G. and Gramma J were watching the caper from afar. Joanne saw them. She did not see the farmer watching her every move. As she crossed the field, so close to completing her mission, the farmer headed her off at the pass. Joanne froze. Her pumpkin splattered. And she high-tailed it out of that field as fast as her little legs could carry her. Trembling, and scared to death, the budding criminal was bursting with adrenaline as she galloped across field – the farmer on his tractor in hot pursuit. Gravely concerned for their daugher/sister’s well being, G.G. and Gramma J practically collapsed, convulsing in hysterical laughter. Joanne did not return home with her pumpkin. Boys – do not steal pumpkins. We will make our own adventures at the pumpkin patch.